It’s that time of year when the leaves are falling, the weather is changing and you craving foods that are comforting. As fall comes into full swing, desserts with apple, figs, vanilla and other tasty flavors are calling. Here are some of fall’s best local treats to satisfy that sweet tooth. 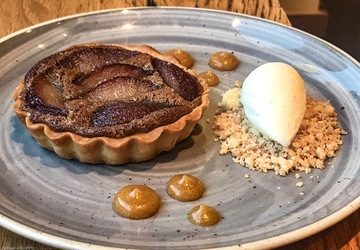 It doesn’t get more fall than this dessert from pastry chef Alex Levin, who combines seckel pears poached in red wine, with ginger spice frangipane and served with vanilla gelato. Anything from Levin is generally a hit, and this one is sure to be too. Who would have thought butternut squash AND curry would make an appearance on a dessert? Pastry Chef Erin Reed from Blue Duck Tavern, that’s who. Satisfy your curiosity and your dessert craving with the butternut squash cake made with squash puree topped with cream cheese frosting, and served with cream, curry roasted apples, coconut sorbet and topped with a red currant sauce. Curry roasted apples might be my new fall favorite! 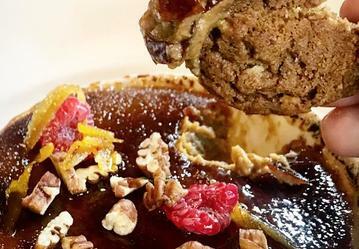 Sweet potato adds a beautiful color and depth of flavor to the crème brulee at Woodward table, which is served with a pecan maple cookie for scooping up the lusciousnesss of the spiced bourbon custard and crunchy caramelized burnt sugar. If you haven’t tried the modern American menu at Woodward Table, you are missing out, so get there asap! 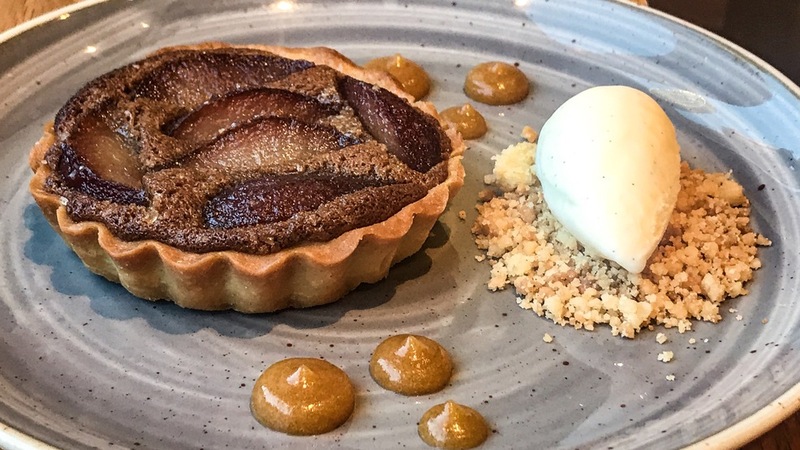 The Granny Smith Apple and Almond cake, served with a cardamom zabaione, pumpkin seed streusel and a spiced pumpkin gelato is the perfect finish and really a MUST to end a meal here. The cake itself is a good mix of sweet and tart, and the spices from the gelato and the streusel back it up and give you all the warm and fuzzy feels. Fans of cheesecake should try the sweet potato version at this Logan Circle neighborhood tavern. 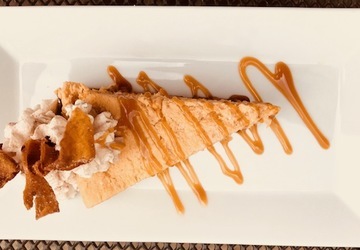 The creamy cheesecake comes with a gingersnap crust, cinnamon whipped cream, candied sweet potato crisps, and drizzled with a caramel sauce. Talk about festive fall flavors! Eat as the French do this fall at ENO Wine Bar with a new seasonal menu featuring comfort foods from the Basque Region of France. Okay, this one’s not a dessert but is equally satisfying. The Fig, Basque Cheese and Walnut is a play on a favorite flavor combination from the region, where many homes in the region have a fig tree. 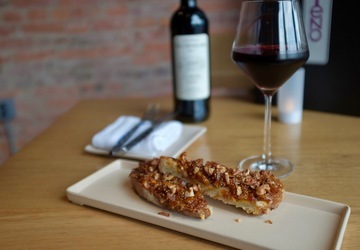 The sweet fig paired with the savory cheese is a dish that is suited perfectly for the season, and is best enjoyed with a glass of Malbec from their extensive wine list. 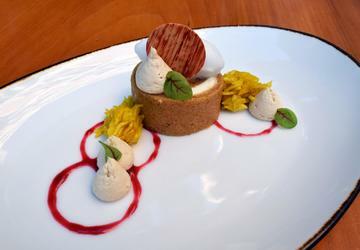 A bounty of autumnal fruit is at the forefront of this spectacular creation by pastry chef Caitlyn Dysart. Bartlett pears are poached in Madeira and served with fresh figs, Italian plum, maple pecans, apples, thyme, whipped mascarpone and The Date Lady date syrup. If that doesn’t scream fall yumminess, I don’t know what does! While you are there, pick up some freshly baked butternut squash tea bread with white chocolate and candied ginger from the market as well! Laduree Georgetown has a whole slew of savory and sweet fall menu items. The apple macaron is their soft macaron biscuit with caramel mousseline cream, roasted apples and sea salt caramel and by the sounds of it, I will be wolfing it down by the dozen. They are also introducing additional limited edition fall macaron flavors of chocolate orange (my fave combination!) as well as milk chocolate -hazelnut. Just some of the many reasons I love fall! Caramel is an unsung hero of fall, in my opinion. 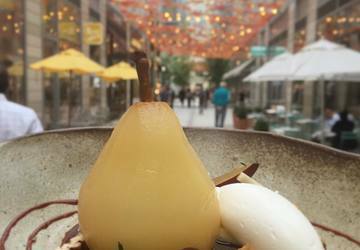 At this buzzy wine bar on 14th Street, taste the essences of fall with a spiced organic pear crisp, served with vanilla bean ice cream and cardamom caramel.